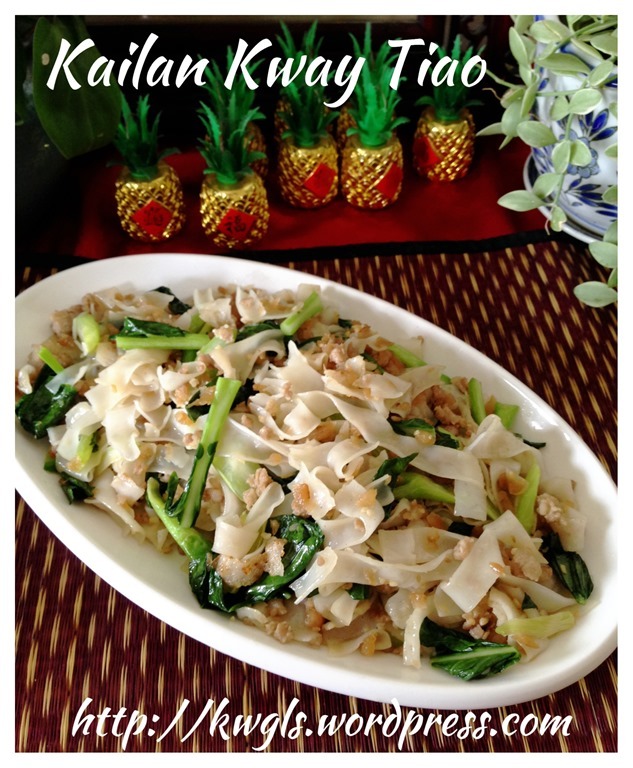 Whenever we dined at Teochew restaurants, my wife would ordered this dish and whenever she ordered this dish, she would grumbled why we never cooked this noodle dish at home..Since I have the ingredients, I have decided to prepare this dish for lunch today. 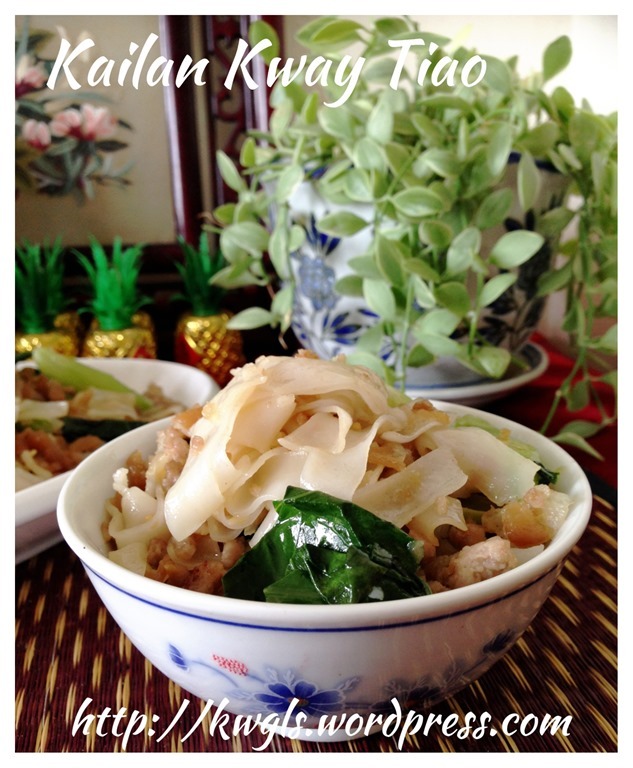 If you are staying overseas and interested in some homemade 粿条， you can refer to this post: Homemade Chinese Rice Noodles–Hor Fun or He Fen or Guo Tiao (沙河粉，河粉或粿条）. 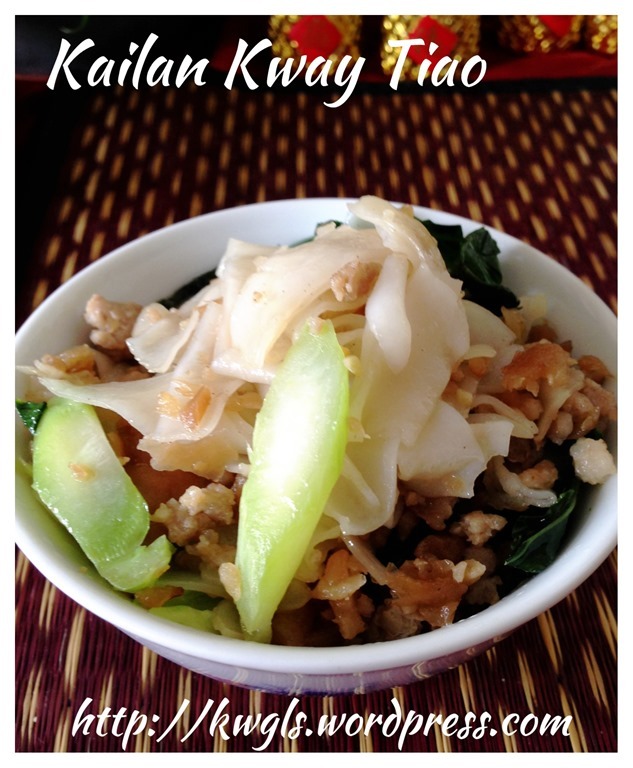 You can also refer to the post on more about the background of this flat rice noodles. 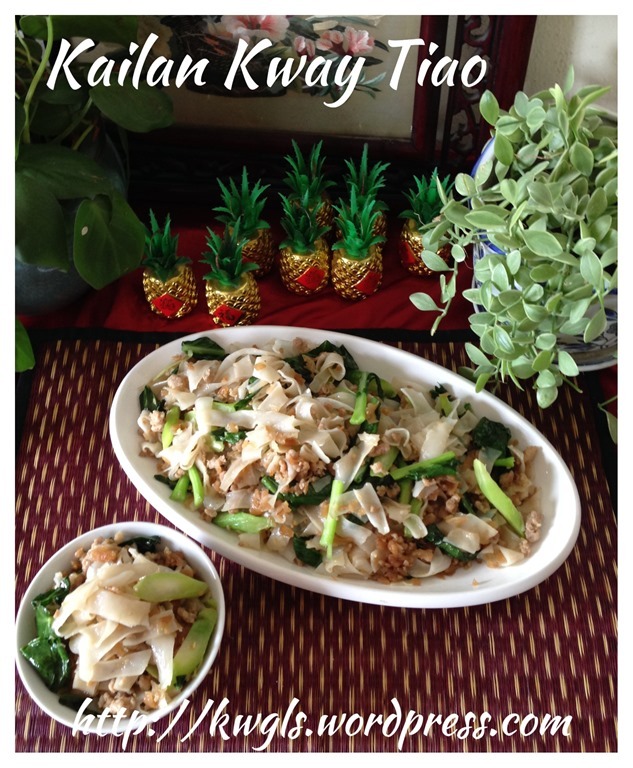 For this recipe, I have added some minced meat in the dish for the sake of my growing and this is totally optional. What I am sharing is a slightly healthier method of preparation without the use of lard and much less oil.. Of course, taste will be better using traditional method of stir frying using lard and MSG. So keep in mind that this recipe is a recipe designed to suit current health trends. Don’t be surprised by the non traditional cooking method. Put some water in the pot, put pinches of salt and few drops of cooking oil. 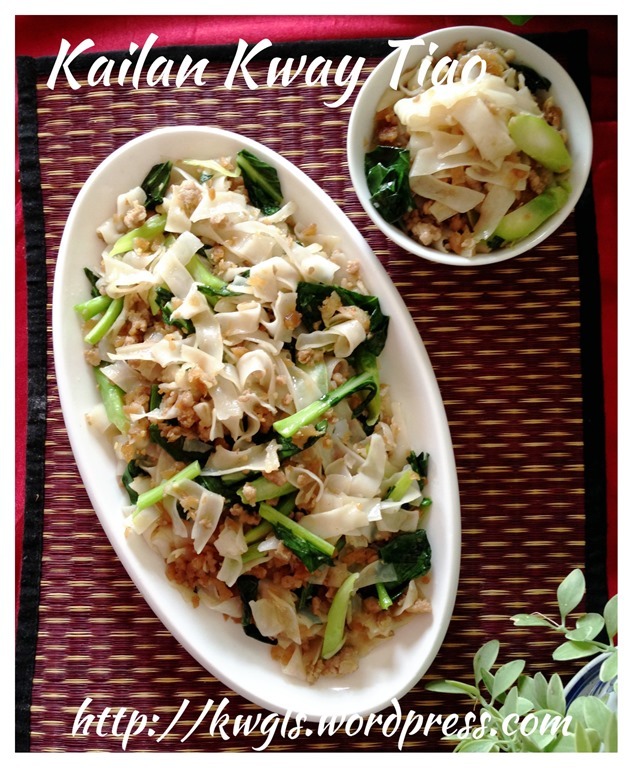 Bring to boil and blanch the kailan until soft. Drain and set aside. The main purpose of this step is to pre-cook the vegetable and is optional. 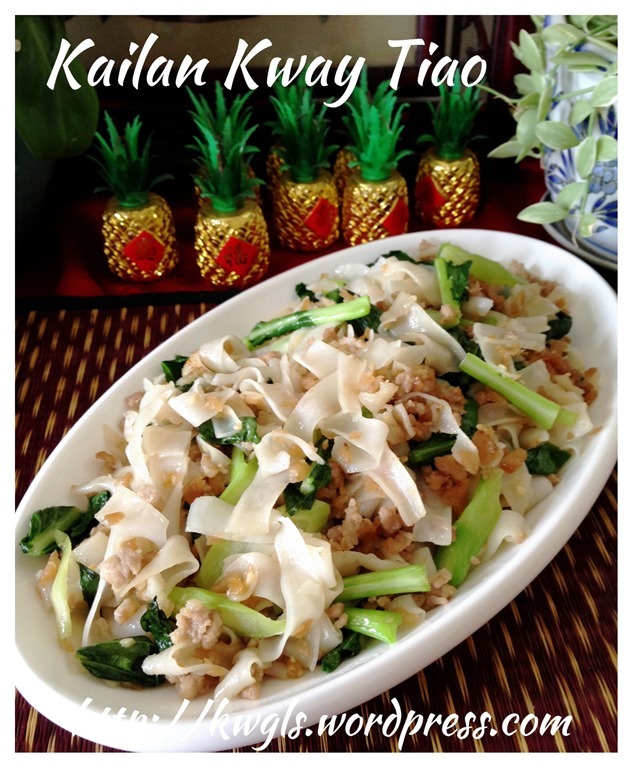 You can add the raw kailan during the noodle stir frying stage but it will be easily become under cooked or over cooked and the colour will be less attractive. In a wok, put the cooking oil, sauté the preserved radish , minced garlic using high heat until fragrant and slight brownish. 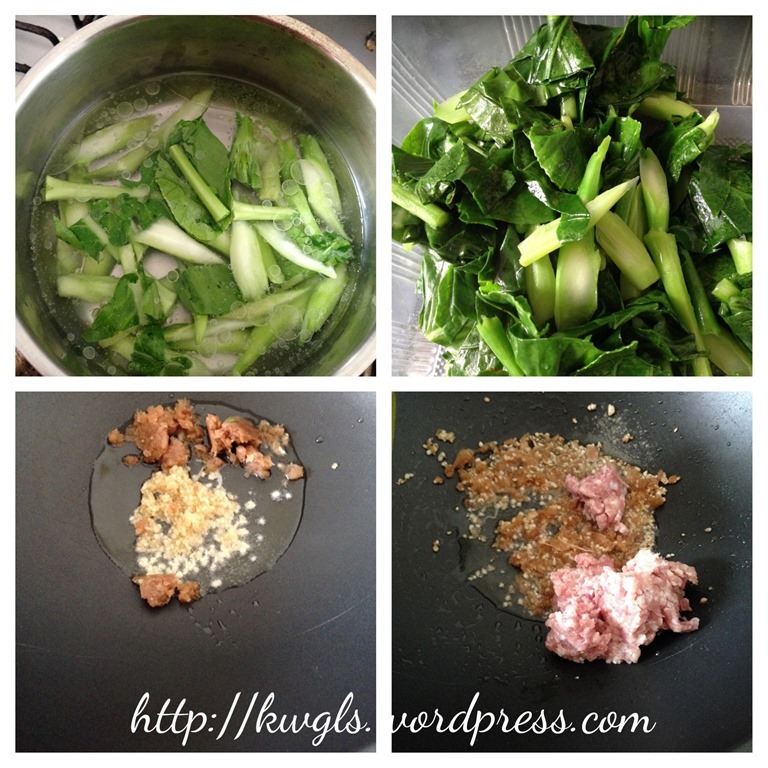 Add the minced meat (optional) and stir fry until the meat is semi cooked (about 2-3 minutes). 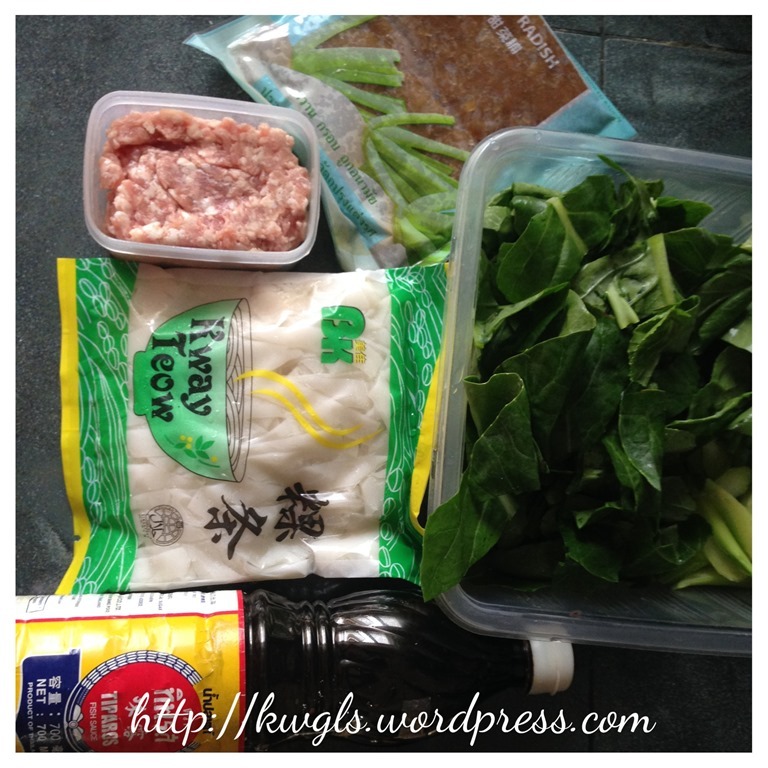 Add the kway tiao and stir fry until well mixed. 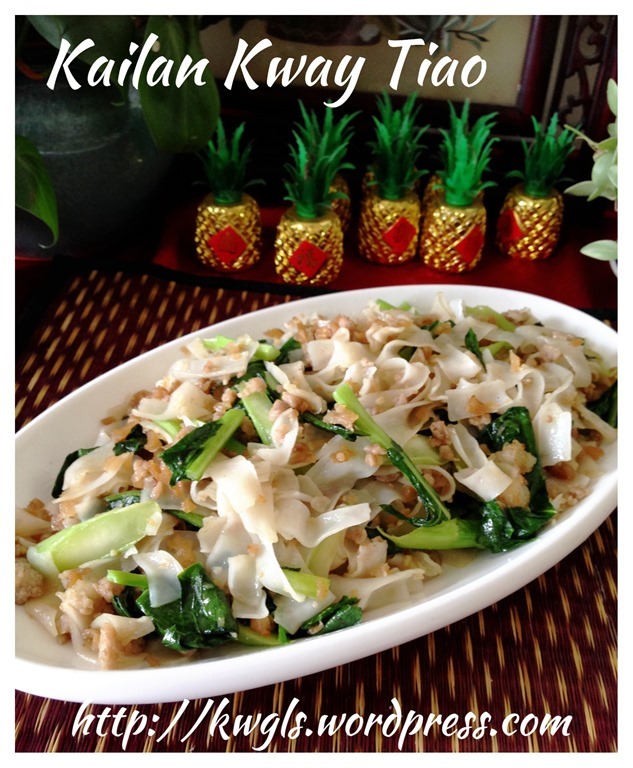 Use a chop stick to stir the kway tiao if it is difficult to stir fry. Add in the blanched vegetables, followed by fish sauce, dashes of white pepper, stir fry until well combined and dish up. If you buy store kway tiao that keep in the chiller, it can be rather hard and there may be a tendency to break. It is advisable that you either water blanch the kway tiao or microwave for 1-2 minutes until the kway tiao is softened before stir frying. 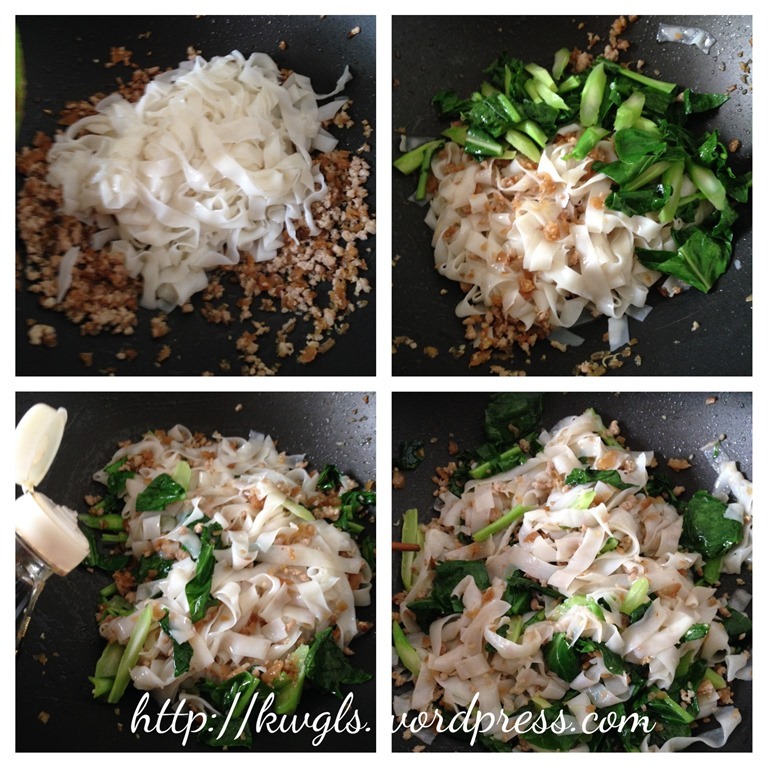 You will need to use high heat throughout the stir frying for better tasting cooked rice noodles. You can use a mix of sweet and salty preserved radish for the dish. If you are using 100% salted radish, you have to be careful in adding the salt as both fish sauce and preserved radish are salty. 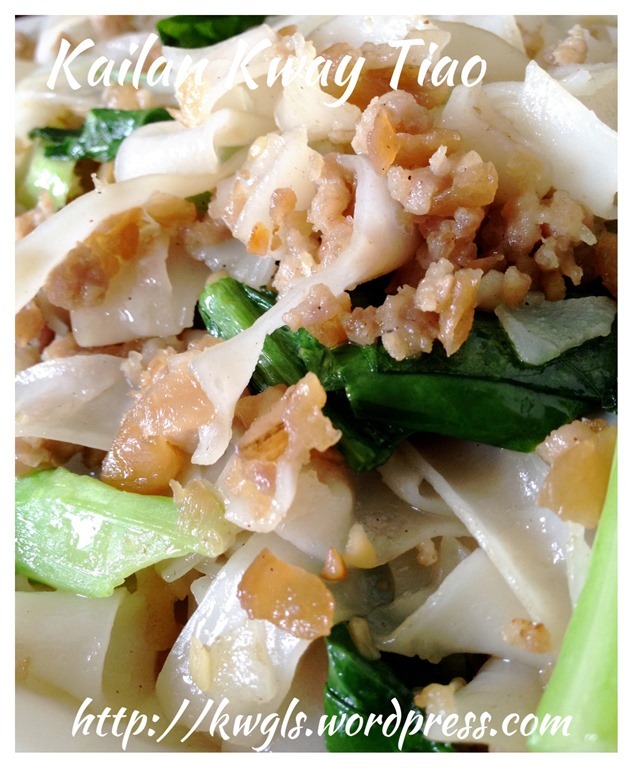 Though simple but this noodle dish is very tasty and aromatic. I hoped that readers from other dialect groups do give it a try..Feel free to add more ingredients such as prawns, fish cakes, meat slices and etc. 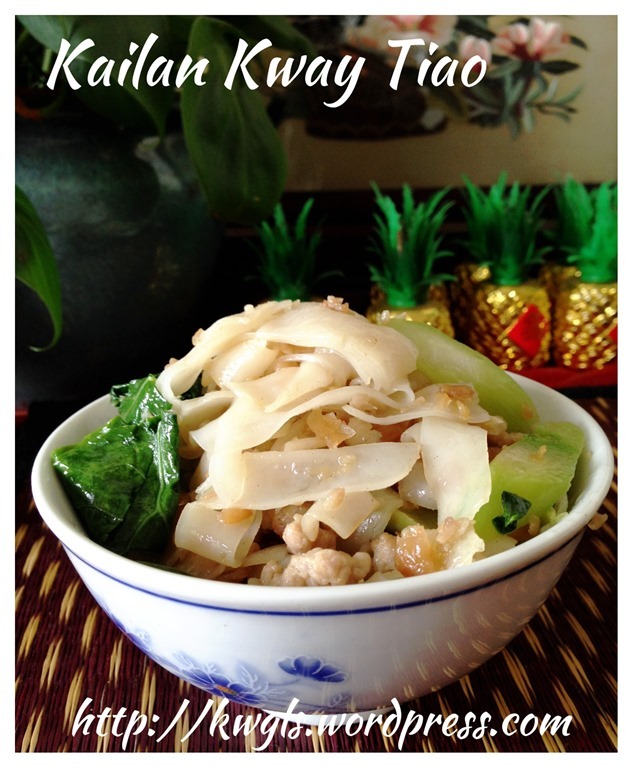 to suit your family taste buds, but as a respect to traditional Teochew cuisine, please do not omit kailan, cai poh and fish sauce from the recipe…If you are still doubtful about the combination, order a plate of this noodle dish when you next frequent a Teochew restaurant. This recipe was included in Page 43-44 of the “One Pot Noodle E-book”. For more One Pot Noodle Dishes, you can have a copy of “Easy One Pot Noodles – A step by step guide” that was packed with 30 recipes, 60 pages at a reasonable convenience fee of USD5.00. The recipes covered various recipes from curry laksa, prawn noodles to fish head beehoon and etc. Of course not forgetting the well like Economy Bee hoon and Mee Rebus . You can purchase by clicking the link above.You can either pay using Pay Pal or Credit card account. Please ensure that you have an PDF reader like Acrobat or iBooks in your mobile phone or iPad if you intended to read it in your ipad or mobile phone. Should there be any problems of purchasing, feel free to contact me at kengls@singnet.com.sg and separate arrangement can be made. 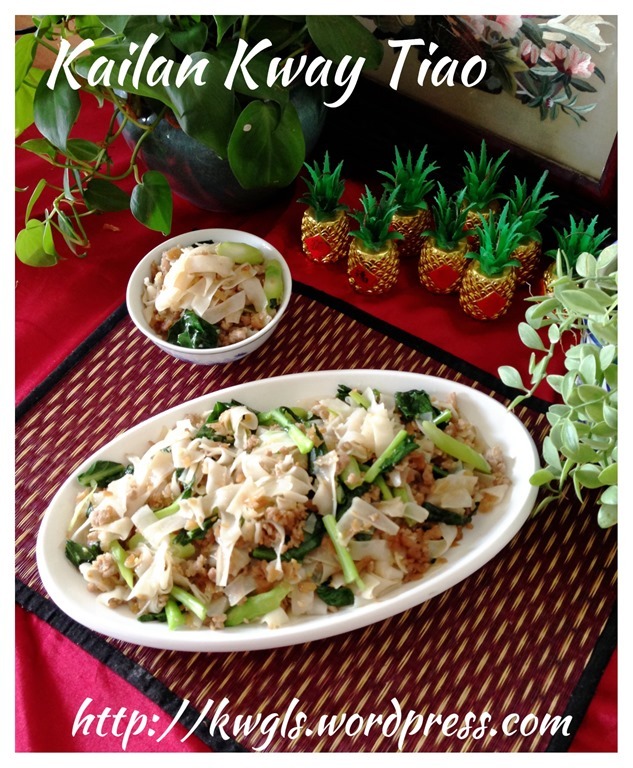 This entry was posted in Food Preparation Series, Noodles and tagged 8, Cai Poh Fried Kway Tiao, 芥蓝菜牛肉沙茶炒粿条, 菜脯炒粿条, GUAI SHU SHU, Guaishushu, Kailan Kway Tiao, kenneth goh, postaday. Bookmark the permalink.